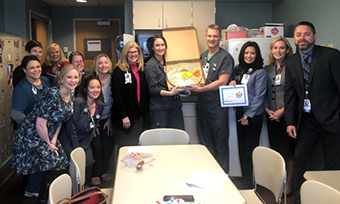 The January Good Catch Award goes to Cyle Plumer, RN, in Critical Care. prompting an order for stat CT scan, blood transfusion and vascular surgeons to assess the patient at the bedside. The labs were questioned by the RN since the patient had a central line requiring a RN to draw labs, and he had no recollection of labs being drawn. The labs were rechecked, and the hemoglobin came back at 10.2. The specimen was later determined to be >24 hours old from another department and was processed without a date on it. Because of Cyle's attention to the lab draws, the CT scan and blood transfusion were canceled. Cyle's actions resulted in process changes that all specimens will be required to have a date as well as time on the specimen. Great job, Cyle, and thank you for your dedication to Methodist and our patients!